Three-year anniversaries aren't usually news pegs. (Three years and a day, even less so, but hey, we were busy.) 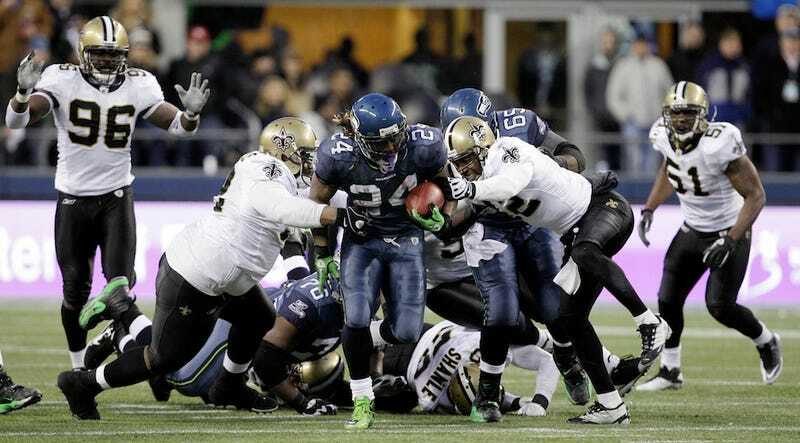 Saturday's Saints-Seahawks playoff rematch makes it a little more defensible. But let's be honest—we don't really need reason to want to revisit and marvel over Marshawn Lynch's incredible bowling-ball touchdown run from 2011. Last month, ESPN spoke to 14 players who were on the field for Lynch's rumble, a veritable oral history of an event that took just 15 seconds from start to finish. Some then-Saints, like Jo-Lonn Dunbar, still seem haunted by it. "I remember the play. I remember where they were on the field. I remember everything...I remember it like it was yesterday." Well, shoot, so do we, and nothing stands out as much as that open-field stiff-arm on Tracy Porter. "I don't want to talk about it," Porter told ESPN. "It was a great run." That was Lynch's first year in Seattle, after being traded by Buffalo for effectively nothing, and neither the Seahawks nor viewers knew quite what he had in the tank. Since then, he's been one of the NFL's top backs on one of its best teams, and it seems odd that anyone ever doubted he still had a gear for Beast Mode. "In a way," says former Saint Scott Shanle, that run "resurrected Marshawn Lynch's career." But again, that's big-picture. Lynch's run is most impressive when you put all that aside, and just watch him go. This sport is so rarely an individual showcase. Even seemingly uncomplicated plays require 11 parts in sync, throws, routes, catches, blocks, decoys. The majority of this run, from when he broke through the hole at his own 40 until his blockers caught up with him at the Saints' 10, was simply Marshawn Lynch vs. the Saints. Football at its most basic—a whole group of people trying to tackle one man, and that man being so strong, so determined, that they can't do it.